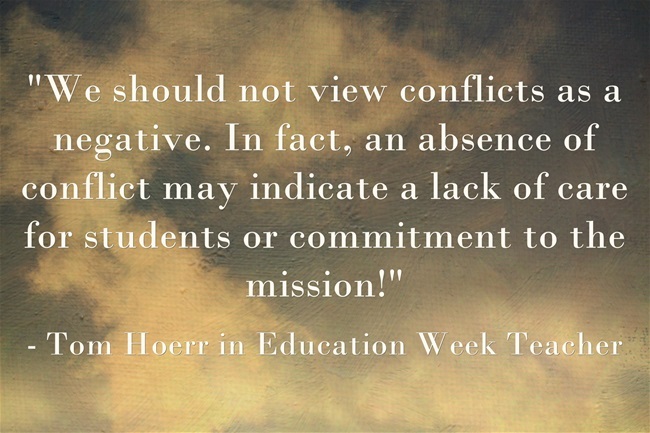 Looking for 'Solutions' in the Face of Staff Conflict - Thomas R. Hoerr, Ph.D.
Tom was featured as a response in this EdWeek Blog post called “Response: Looking for ‘Solutions’ in the Face of Conflict” by Larry Ferlazzo. Read Tom’s response below. What are your suggestions on how to resolve teacher-to-teacher and/or principal-to-teacher conflicts? I led schools for 37 years and taught for years before that, so let me begin by sharing my bias: conflicts are inevitable when people come together. That’s true at the dinner table, it happens on the softball team, and it occurs in the work setting. Schools are no exception, so we should not view conflicts as a negative. In fact, an absence of conflict may indicate a lack of care for students or commitment to the mission! Principals want teachers who are advocates for their students and who will work to make the school better, and that includes being willing to raise hard questions, take difficult positions, and not always accept the status quo. Important and necessary as those actions are, they often create conflict. How administrators respond to conflict – what they do or don’t do – is framed by how it is viewed. My position on conflict is the friction approach, i.e., it is inevitable that as objects or people rub against each other, friction occurs and heat is generated. Another approach is the medical model of conflict. In this approach, conflict is like a disease, and it should be eradicated by medicine or, even, removed through surgery. How we feel about conflict will be quite apparent to others. Because I view conflicts as opportunities for communications and a chance to learn, my strategies are fairly direct. First, recognizing that people will see things differently, it’s important to create rich and open two-way communications channels. Principals are pretty good at communicating TO teachers: we hold staff meetings, send memos, and frame efforts. But we also need to find ways to hear FROM them. We need to provide different vehicles for staff members to let us know what they are thinking. My weekly staff bulletins frequently asked questions, and I sent surveys to the staff during the school year (using Survey Monkey in the spring). I also offered several “Breakfast With Tom” sessions during the school year. Held during a late start or conference day, these were optional times for staff members to come and ask me whatever. The invitation would say “The agenda is yours.” Typically, a third or fourth of the faculty would join me, and we would discuss a range of topics and concerns. While my schools were not without conflicts (I have the scars to prove it), offering frequent and open two-way communications channels to the staff helped me address small problems before they became big conflicts. Second, I worked to find compromises and be part of solutions that weren’t based on my title or position in the hierarchy. Good leaders recognize that people need to have an investment in their work and that means giving them autonomy and providing support. Understanding and appreciating that teachers would see things a bit differently and act accordingly also helped avoid or ameliorate conflicts. During those times when my position meant that I was being the decider, I was clear about this ahead of time so that others didn’t feel used in the process. As in so many areas, intentionality and transparency are very important. Principals need to do more than make decisions; we need to be part of the dialogue and we need to share our rationale. Finally, how we handle conflicts – how we create situations to avoid or minimize them and how we respond when there is a problem – happens within the context of our relationships with teachers. If we routinely listen and regularly show them respect, if we are quick to praise and give them support, we will still have conflicts. Again, that’s part of life, like breathing. But if we have created a climate of trust, respect, and learning, conflicts will be ameliorated because everyone will work to understand one another and come together.